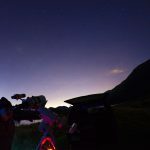 Once a source of wonder–and one half of the entire planet’s natural environment—the star-filled nights of just a few years ago are vanishing in a yellow haze. Human-produced light pollution not only mars our view of the stars; poor lighting threatens astronomy, disrupts ecosystems, challenges crime and safety, affects human circadian rhythms, and wastes energy. View light pollution in the Metro-Vancouver area on this map and watch SUPERnova Episode 3 for some for some local solutions that anyone can do. Now is the time to write a letter to your local government and ask what they are doing to control the use of lights and more importantly what they are doing to stop the pollution into our night skies.